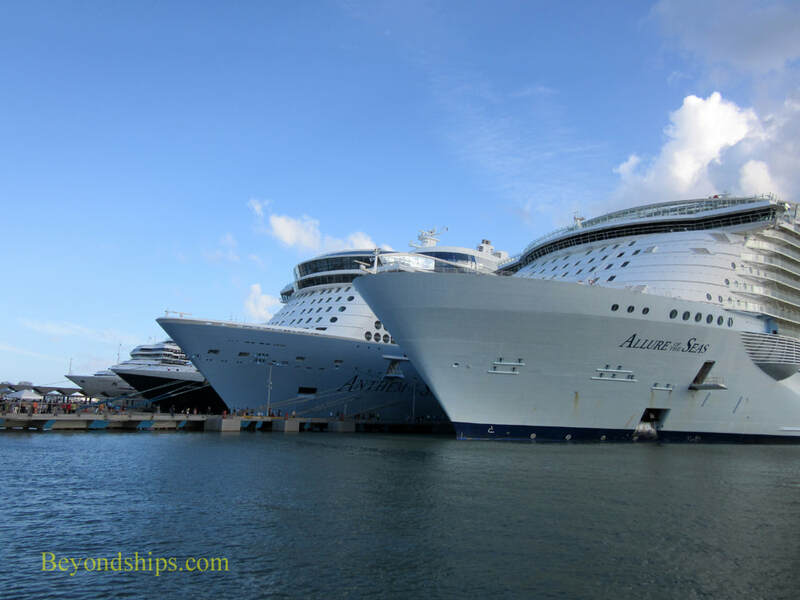 Three large cruise ships – Carnival Glory, Eurodam and Allure of the Seas - - were docked in front of Old San Juan when Anthem of the Seas arrived. Just Anthem and Allure were respoonsible for bringing more than 10,000 visitors to the city on this day. Despite the ordeal caused by the 2017 hurricanes, the 600 year old city had no problem absorbing these people. 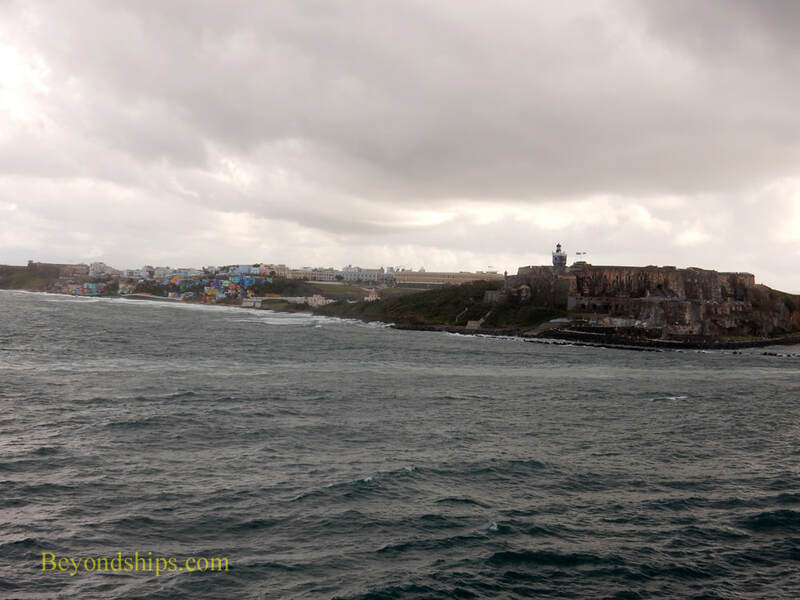 Sailing into San Juan Bay, there was some evidence of the storms. 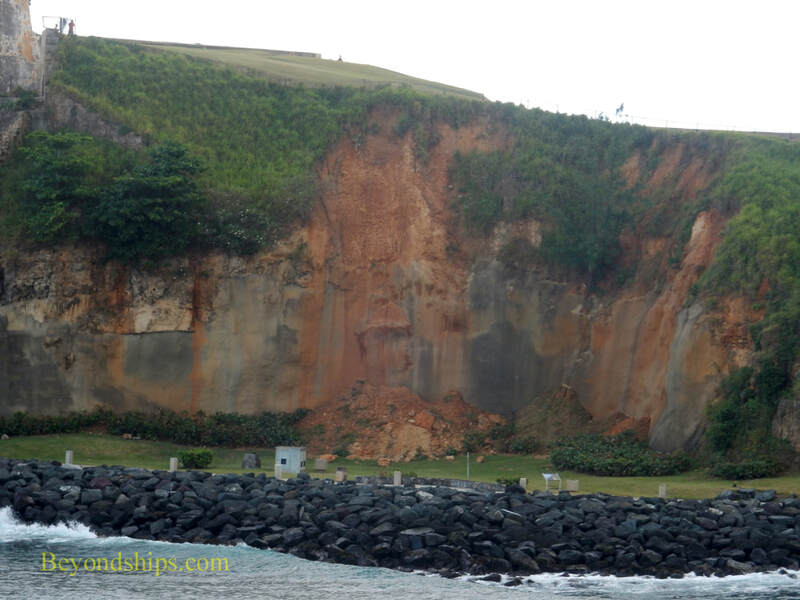 Near the El Morro fortress, there appeared to have been a landslide where part of the cliff had collapsed down near the walkway that runs along the entrance to the bay. 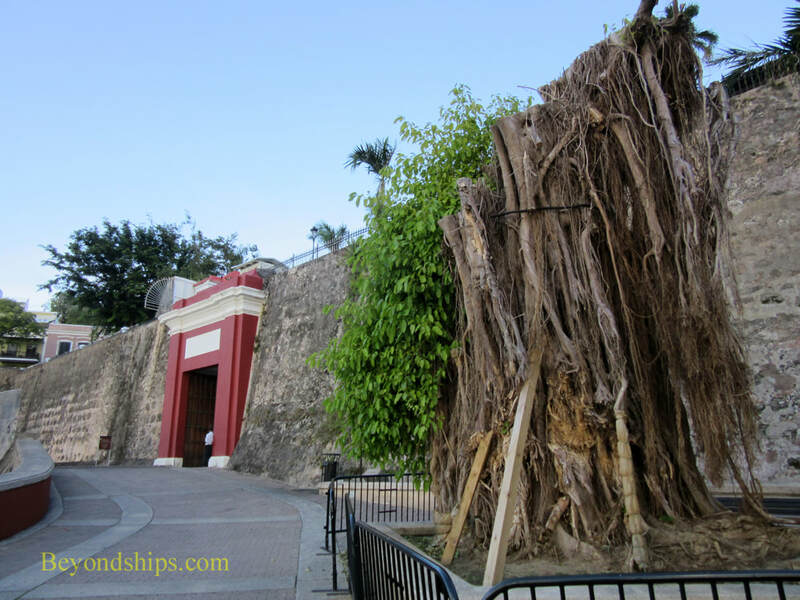 Further along, the ancient Banyon tree that has stood by the gate to Old San Juan for centuries had lost almost all its foliage. (However, upon closer inspection one could see that there are green shoots growing out of the old tree trunk). As evidenced by the fact that there were four big cruise ships at the piers, the cruise port in Old San Juan is alive and functioning. The fact that one of these was the second largest cruise ship in the world underscores that this is still a first class cruise port. Outside of the cruise port, Old San Juan appeared to be pretty much as it was on my last visit in early 2017. The street in front of the piers was crowded with people offering various tours and with vendors selling souvenirs. Across the street, Senor Frog's was jumping. People looking for everyday items that they had forgotten to pack were going into the Walgreens and the CVS. Walking toward the La Princessa fountain, people were sitting in the outdoor cafes as the late afternoon sun sank in the west. Perhaps there was less foliage on the trees than before but perhaps not. The atmosphere was the same. Through the city gate and into the residential area near the governor's mansion. The charming houses with their wrought iron balconies showed no signs of storm damage. The ferrol cats that seem to congregate in this area still strolled around ignoring the tourists. At the top of the street, the old Cathedral had its doors open and was reeceiving a stream of visitors. Nearby, the pretty El Convento Hotel appeared to be much the same as always. I walked up the hill until I came to the vast fields that spred out infront of El Morro fortress. It was too late in the day for the locals who often gather here to fly kites. But again, there was a steady stream of tourists heading toward the fortress. Returning to the ship, I noticed that most of the stores in the main shopping area were open for business. I did see some that were closed but I could not tell whether that was because of the storm or because of the lateness of the hour. 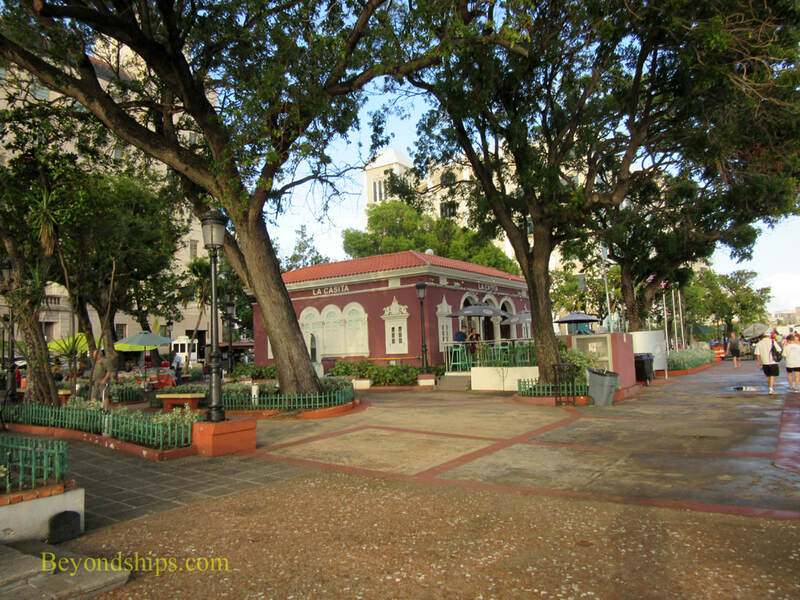 Old San Juan had clearly survived and had mainatined its traditional charm. Although I did not venture out of the old city, I noticed that the ship was offering shore excursions into the new city and the surrounding area. This included the popular tour to the Baccardi rum factory on the other side of San Juan Bay. There were also action-oriented tours out to the Carabali Rain forrest butnone to El Yunque National Forest itself. Here and there are visible signs of the wrath of the storm. Above: A landslide near El Morro. Below: The ancient banyon tree near the city gate is starting over. However, much has returned to normal. Above: The cruise ships have returned en masse. 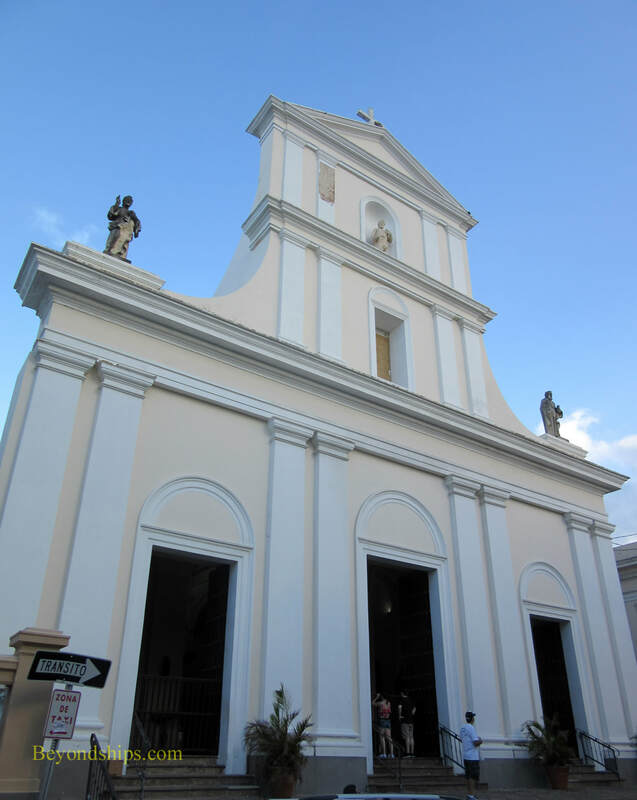 Below: Landmarks such as the cathedral in Old San Juan are open to visitors. Above: Cafes and stores along the waterfront promenade.